Recently, the Library changed its circulation rules for students and staff, and instituted a new recall procedure. Students and staff are now able to charge out regularly circulating materials for the entire semester. Items will be due at the end of the current semester. Items will no longer have a 30 day due date. To accommodate another patron’s need for information, the library has instituted a new procedure for recalling items on loan. If a title is checked out, another patron can ask that the title be recalled. The library will email the user who has the title and explain that it is recalled. Recalled items must be returned to the library within 14 days of the notice. The recall notice will include the new due date. Items not returned by the new due date will be considered overdue, and fines will be assessed. When the book is returned, the library will notify the requesting patron by email and hold the book for 10 days. Circulating materials not requested by another borrower may be renewed for another semester. Requests to recall or renew a checked-out item can be made in person, at the circulation desk, or by emailing or calling the circulation desk ((718)780-7973; circdesk@brooklaw.edu). *These new rules and procedures do not apply to material on reserve in the library. 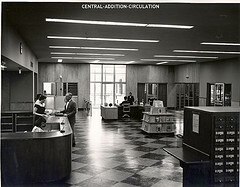 **The photograph, which appears in this post, is courtesy of Providence Public Library’s Flickr Stream.